Our Interlibrary Loan/Document Delivery Service provides all CSHL users fast, personalized access to: journal articles, books, and other materials both owned by the library online and in print, borrowed from other institutions or purchased from publishers. Most articles requested are delivered to you electronically within 24 hours and books within 5 business days. There is no charge for a basic ILL request. Small charges for rushes, scans, and postage are charged to your lab quarterly. (see Tab for charges). A grant or department account# is generally needed when an article is purchased immediately from a publisher. 1. Register for and use your ILLiad Account, a software platform that manages all requests & links you with our CSHL Library resources. 2. Register for a My NCBI account in PubMed. Click on the Tabs above to set up your ILLiad and My NCBI accounts. Click on the blue CSH button in PubMed and other databases to download or order material once you have an account. Click on My ILLiad Homepage to order materials directly. On the bottom of the Logon to ILLiad panel, Click New User on the bottom of the right panel. Create an ILLiad account or sign in to your ILLiad on the panel to the right. It must be 6 characters, lowercase and different from your email/Windows password. when you're traveling or off campus without using VPN. Fill out the New User Registration Form (illustrated below) Click the Submit Information Button & Logout. *Go to the MyNCBI Tab to sign up for an account using your secondary password. Illiad is a Library Service that allows you to track your requests and view your articles online. It requires your CSHL email username and password to register. If you have not registered as an ILLiad user, please click on NEW USER now. © 1996, 1998 Virginia Tech Intellectual Properties, Inc. © 1998, 1999, 2000 Atlas Systems, Inc.
You are now ready to submit requests on ILLiad. Use the middle pane on the ILLiad Main Menu pagel to place a request. 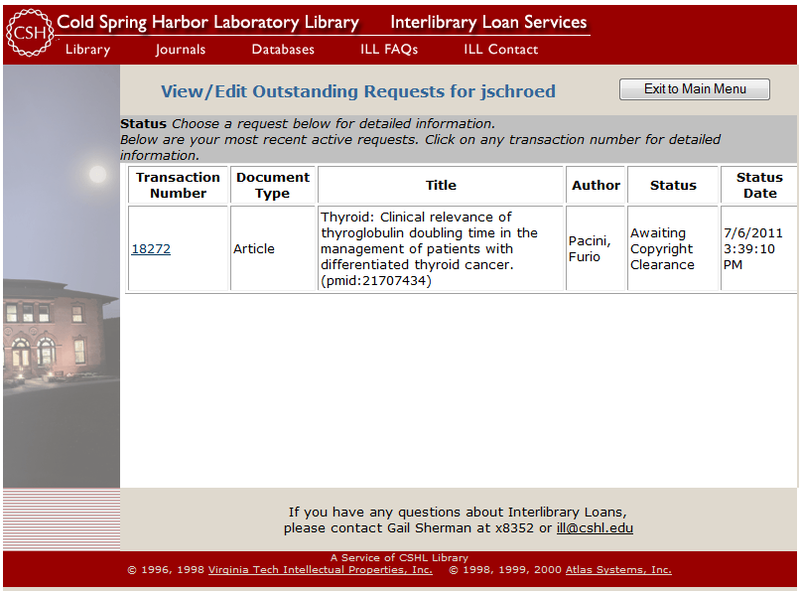 or go directly from PubMed using you MyNCBI account or another database. You can review any of your requests by clicking on left panel buttons. 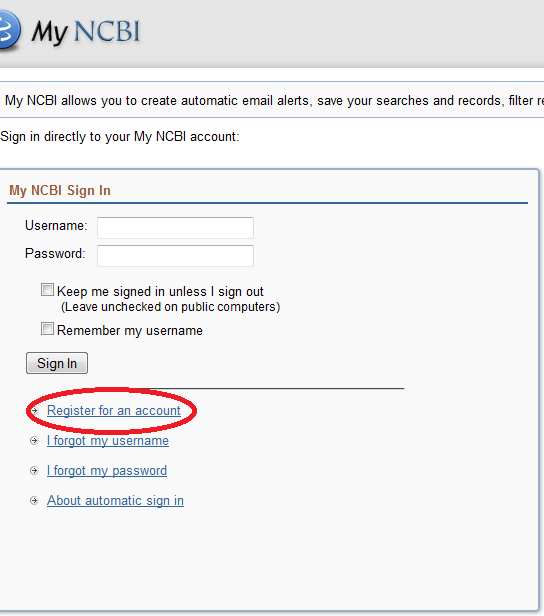 Please set up your required MyNCBI account in PubMed by clicking on the MyNCBI tab on the top menu. Articles downloaded from publisher: $12-$50 will be charged to a grant number pre-authorized by CSHL user. Charges are billed quarterly from the Library through the Accounting Office to the individual departments & labs. In the upper right hand corner, click on Sign In and create an account. 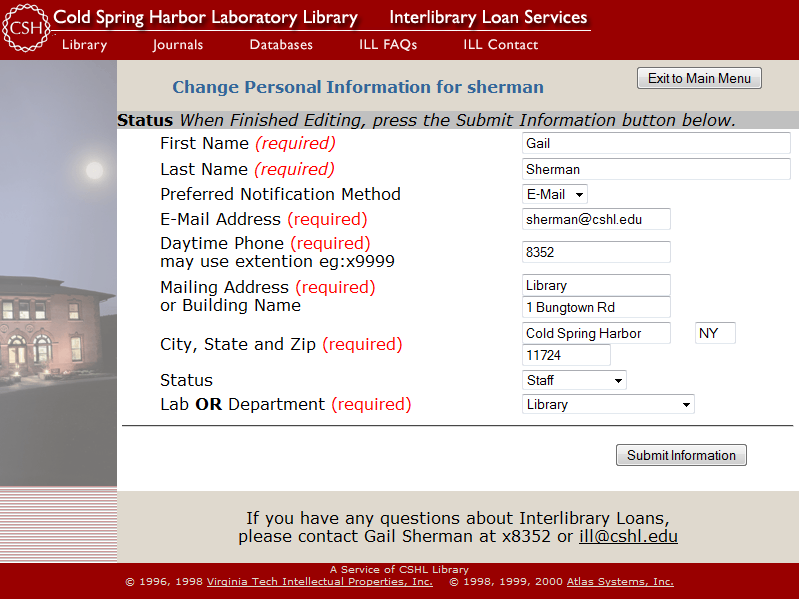 Click Outside Tool, Click the "c's", scroll to Cold Spring Harbor Laboratory Library and click the oval to the left. 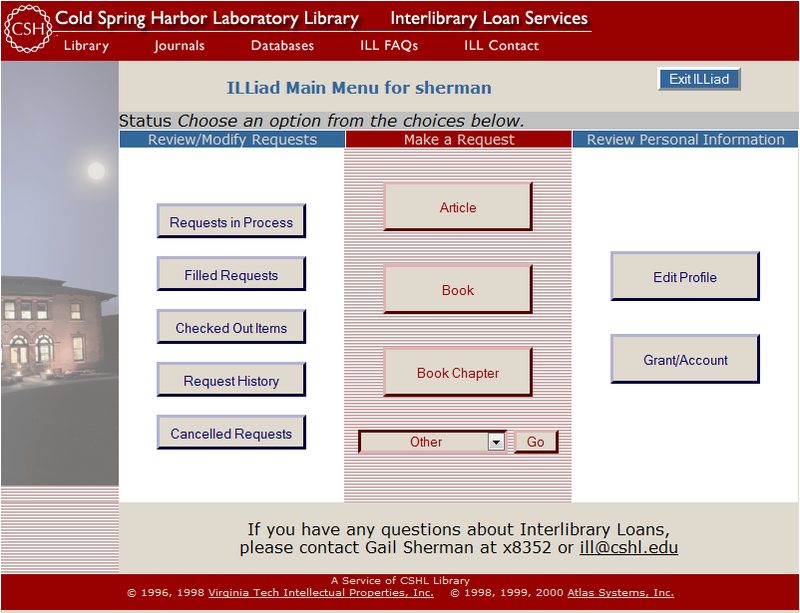 This links you to both the library's online holdings and with ILLiad if you need to request material. To retrieve or order an article when searching in PubMed, please make sure you are first sign in to you’re my NCBI account. Then, either click on the citation or the yellow rectangle next to the citation. If the library subscribes to the journal online, you will be able to click on the link and download the article as a pdf. If we have it in print, you will see a link to the library catalog and where the material is shelved. The request form for the specific article will already be filled in for you. Hit submit at the bottom of the form and the request will be sent to the CSHL ILL Office (Gail). If you don’t see the ILLiad link, click on “Advanced”, then click on ILLiad and log on.